Q: How did the individual athletes at the Olympics react to being part of a team? RW: There is a really wide range of people, personalities and cultures in the Olympic team. We try to find the things that we all share and have in common. There is a very strong pride in representing NZ and so all athletes, whether individuals or team tend to embrace the concept of mutual respect and doing everything they possibly can to help each other. Especially post competition, some of the good will and support from those who had finished was a privilege to observe. Although many of our athletes are individual, they all have support teams around them – including us – the NZOC. One really common reflection was from athletes who often travel by themselves commenting how much they enjoyed the team environment. Q: Can you rate Rio v Beijing? RW: They are all very different. For sure Rio had its challenges and provided more workload than anticipated. For me they were also very different because of my involvement – Beijing as an athlete, Rio as an administrator. Despite what the delivery may be like the sport is always spectacular and takes all the attention as it builds momentum. Q: Why do we as a nation over-perform? Is it our mental makeup? RW: We are performing really well as a sporting nation – also outside of Olympic sport. A lot of this is the good people we have involved, combined with some good targeted investment in sports. We are now working well together as a group of sports although there is more we can continue to do in that space. We are now sharing a lot of information, technology development, funding initiatives etc. Q: Would you describe yourself as a late bloomer as an athlete? RW: Yes! – I was very late developing. I will always wish I could have done more in sport – i.e. have won the amercias cup, and have played rugby for longer, but life is not perfect and for the last 20 years I have done what I was really passionate about – so I will never have regrets. Q: What did you learn when you took time off school to study in Japan? RW: I enjoyed my time in Japan a lot, although I was ready to leave school when I went there, and going into full immersion as a student again was challenging as Japanese schools are very strict. I became very involved in Judo which I did for many hours a week. It gave me a confidence and I believe helped my agility. Whether it did or not, I believe it gave me an advantage having been exposed to such a different sport. I am a big fan of that approach in developing children in sport. Q: We all have self doubt/nerves when approaching competition- I’m picking high achievers are not exepmt from this. Was there alot of self-talk/mental affirmations? RW: For sure, mental approach is huge. We spend hours training our bodies to become stronger and fitter, and they do. The mind responds the same way. Mental skills is a big part of our team in Rio, and I believe we can do more in this space going forward. When athletes are on song, they don’t hope to do well, they know they are going to do their best. Q: I think a surgeon is alot like an elite sports person, performing on a stage in an ultra high pressure environment. Is it important to get away from it all? RW: My feeling as an athlete was that overconsuming thoughts are not helpful. However every athlete has a different way of handling pressure and some people like to sign off, some find it valuable to have it front of mind. I think the key thing is knowing what you need to do a long time ahead and having that well under control and planned for the pinnacle event. Q: Did the pain when grinding on the boat get close to the Erg? RW: Ergs are worse, you are in a very sustained pain for a long time, and go in to extreme oxygen debt. Grinding is very tiring, but you tend to do lots of short hard bursts. They are different physiologies – sailing is a lot more strength and power, Rowing is more fitness and endurance therefore more lactate burn! Q: Was it just money that beat us at the last America’s cup? RW: There will be lots of different opinions on why we lost the last Am cup and they will depend on who you talk to. On the face of it Oracle came up with superior technology that enabled their boat to go faster upwind. Whether that was because of more investment it’s hard to say. The technology may have been something very simple and cheap, often the best ideas are. It’s a mixed emtion looking back on that cup. On one hand, gutted at the loss and on the other hand proud of NZ and what it achieved with its innovation, technology and integrity. Q: What causes/charities are you passionate about? RW: Too many! There are not enough hours in the day unfortunately. I have spent many years involved with the Home of Cycling charitable trust (new avantidrome in Cambridge), Halberg disability sports foundation is another key focus of mine and I have done a lot with a Cycle trust called ‘Te Awa, The Great NZ River ride” – which is a cycle way that goes along the Waikato River. I really enjoy working in the not for profit sector and achieving great community outcomes. Q: Do you think sport could play a role in youth offending? RW: I am not closely connected with youth offending or have detailed understanding why and how it comes about. However I will comment that sport provides a great outlet and focus for young people and enables them to channel their energy into something that can have such a positive outcome – both for themselves and the communities around them. The things we gain from sport are friendship, teamwork, sense of belonging, wellbeing, confidence, – which are all things that can help in other areas of life. Q: You’ve punished your body in certain ways- but has it come through in decent condition? RW: Kind of! 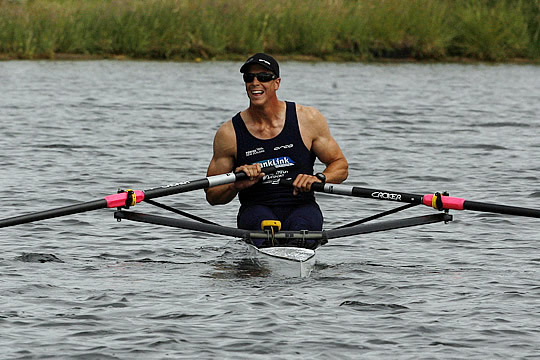 I have an irregular heart beat (AF) which plagued my rowing career. I had ablation for it in 2009 and it has made a big difference but it was a problem that got a real hammering in rowing – because of the extreme levels of fitness you aim at. It’s almost not there, but in time it will likely come back – something I may not have had till I was much older but was accelerated because of rowing. Other than that I’ve kept a pretty good base and have been told by friends that I’m rowing in the masters games with them next year!